Orb, Sceptre, Throne (apart from being a very awkward title) is a novel I've anticipated for a while. Though written by Erikson's co-author, Ian C. Esslemont, it concludes one of Erikson's most tantalising sets of plotlines: Darujhistan. Left dangling after Toll the Hounds - with clues to Tyrants, more than a few pickled Seguleh (long story), and Torvald Nom's connection to the Moranth. ...How I love Torvald. But that's another story. If you haven't read Toll the Hounds, be aware that this review is for its sequel - and as such will contain both minor and major spoilers. Beware! Orb, Sceptre, Throne picks up almost where TtH dropped us off: plotlines everywhere. We're back in Darujhistan, City of Blue Fire, and it's not a happy place. An unearthed tomb releases one of the city's ancient rulers, and the T'orrud Cabal is suddenly threatened (along with Rallick's lover, Vorcan). Torvald Nom is left in the unaccustomed - and unfortunately also unpaid - position of Councillor, but as the city prepares for war, is soon dragged into action. A good thing, since he's one of my favourite characters of the Malazan series. Predictably, old friends are soon tugged into the mix: the retired Bridgeburners at K'rul's Bar, Caladan Brood, and of course, the Malazan Empire itself. As you can see, Esslemont throws a lot into the mix for one of the shortest Malazan novels. Though Orb, Sceptre, Throne is a weighty tome in hardback, it's only 600 pages - far under most Erikson novels. Though it doesn't feel rushed, it's packed with tantalising clues, resolutions, and old friends. There are some surprising additions to the cast, and some of those moments are perfect: character humour in Erikson's vein. Scenes with Raest and Tufty come to mind - though make sure you've at least read up to Toll the Hounds before reading this. What many readers will be looking for, however, are the characters. 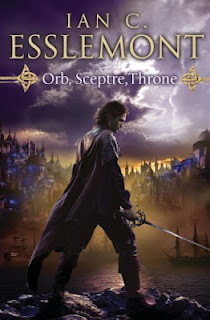 Esslemont has taken over writing many of Erikson's original characters in Orb, Sceptre, Throne - and fans may recall that many such felt 'off' back in Return of the Crimson Guard. Thankfully, this problem is almost entirely alleviated: most voices are handled perfectly, and I was particularly impressed by how even the more difficult Studlock and his ilk sounded almost exactly the same. Which, of course, is very desirable! Writing, likewise, has improved massively. Esslemont's prose has been increasing in quality for a while, but Orb, Sceptre, Throne is definitely his finest book yet: a talented hand for characterisation and a keen grasp of storytelling tricks make OST far superior to earlier ICE novels. One thing that did fall short, however, was in the climax. While generally more than satisfactory - with many characters playing long-overdue roles and a great deal of resolution (far more than Erikson's last few novels) - Scorch and Leff's inclusion felt - well - wrong. I won't spoil it, but the comic relief-bearing duo are inadvertently responsible for a major event, and the way it's carried off comes off as uncharacteristic: while in Toll the Hounds the pair were amusing, Orb, Sceptre, Throne makes them merely annoying. In other aspects, however, it's a great deal of fun - and definitely include that expected Malazan convergence. Plotlines built up for books terminate in Orb, Sceptre, Throne, and while sometimes we're merely seeing the aftermath, learning what happened after the massive Toll the Hounds convergence is just as satisfying as a battle in its own right. OST isn't quite an Erikson, though - the convergence is smaller, as are the emotional stakes. While a great read, this is not Memories of Ice. Stefan Raets (over at the fantastic Far Beyond Reality) has pointed out if a film of this was ever made, its soundtrack would be the OST OST. Which would be very amusing. Good to hear - I've only read Esslemont's first 2 books, and have been a bit gun-shy about returning to Malazan after the disappointments of The Crippled God, but I like the idea of a Toll The Hounds sequel. The idea of exploring the remnants of Moon's Spawn is a great hook too. I agree - and Antsy's is one of the best plotlines. I do wish he'd kept a bit more of his Erikson character, though (his moments of total weirdness, or when we discover that his memories are enacted by stick figures). We get a fair bit more resolution to some of Erikson's longstanding plotlines, too, so I'd recommend it for long-time readers too.